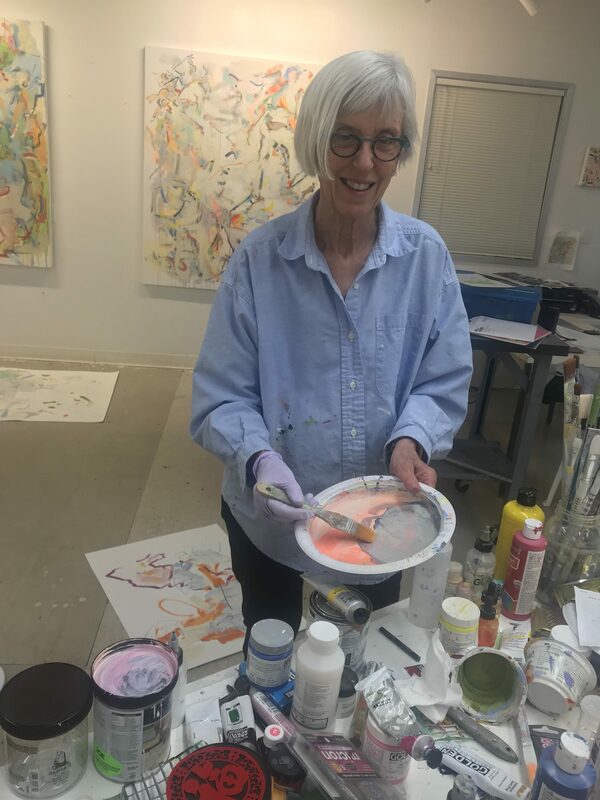 Gina Werfel’s creative days are decorated with everything from cycling to swimming, coffee to drinks, jazz to rock, and, of course, plenty of painting! 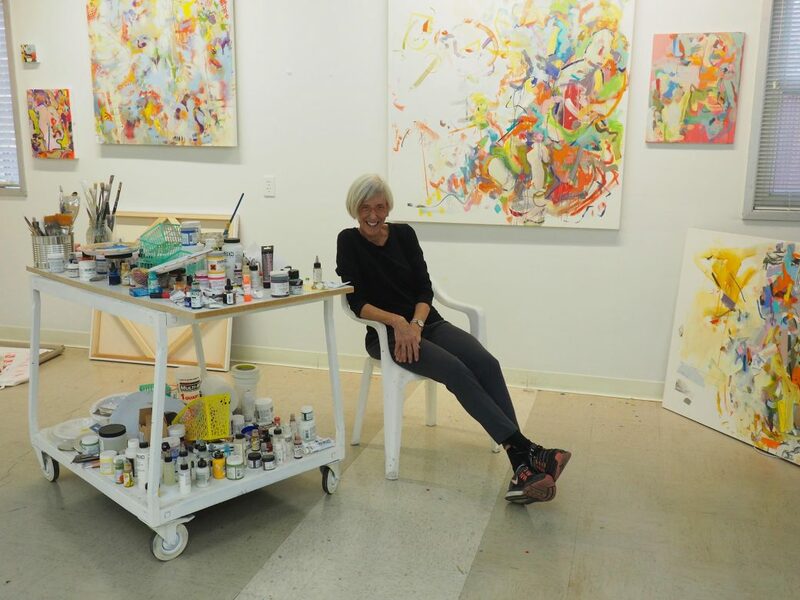 Read on as she lets us into her studio, process and life. I read the NY Times and have coffee. Then I head to the studio by bike or car two miles from my house. 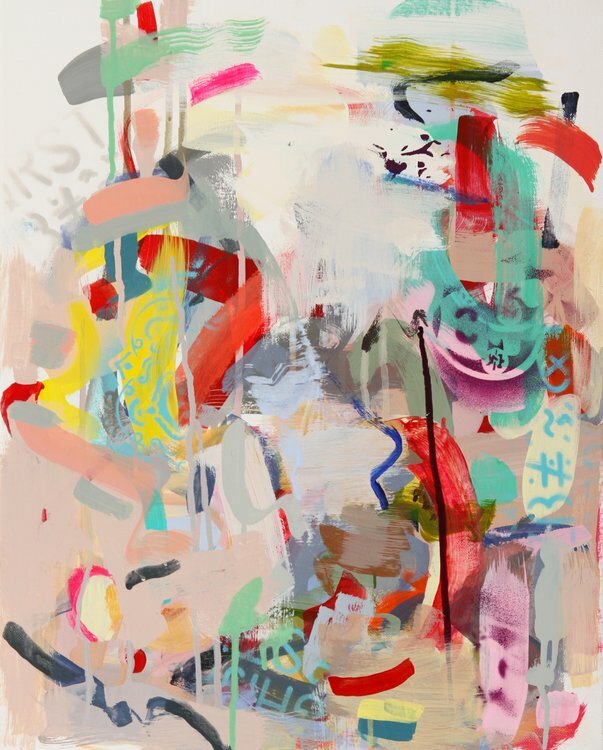 I love the materiality of paint and collage and the interaction of color in painting. I think about how my body moves in alignment with the marks I make. Gina at work on a new piece. I work in a private studio that is about 900 square feet. It is square in format and I work on paintings on the walls and floors with several works in process at the same time. I studied at the New York Studio School whose teaching was based on Hans Hofmann’s push/pull spatial approach. 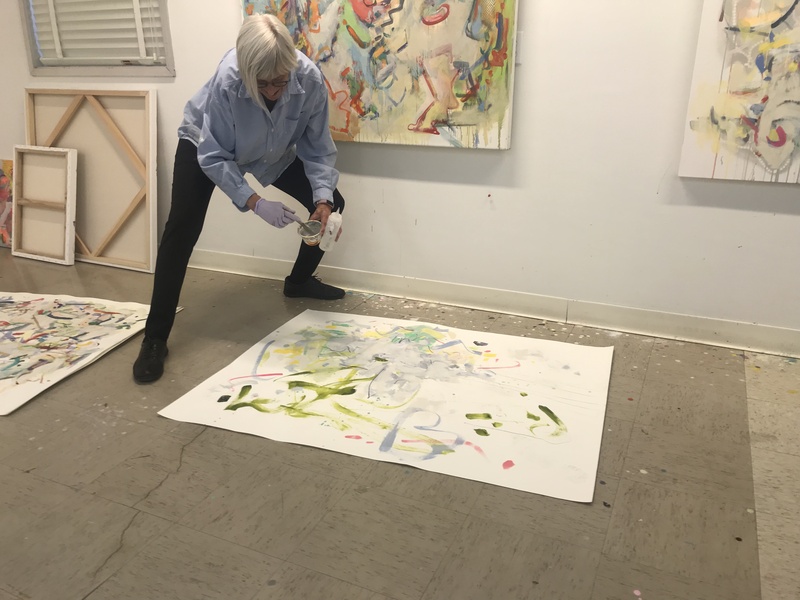 I am still intrigued by the New York School’s 2nd generation artists such as Joan Mitchell and Helen Frankenthaler in addition to contemporary artists such as Katherine Bradford, Amy Sillman, Charlene von Heyl. 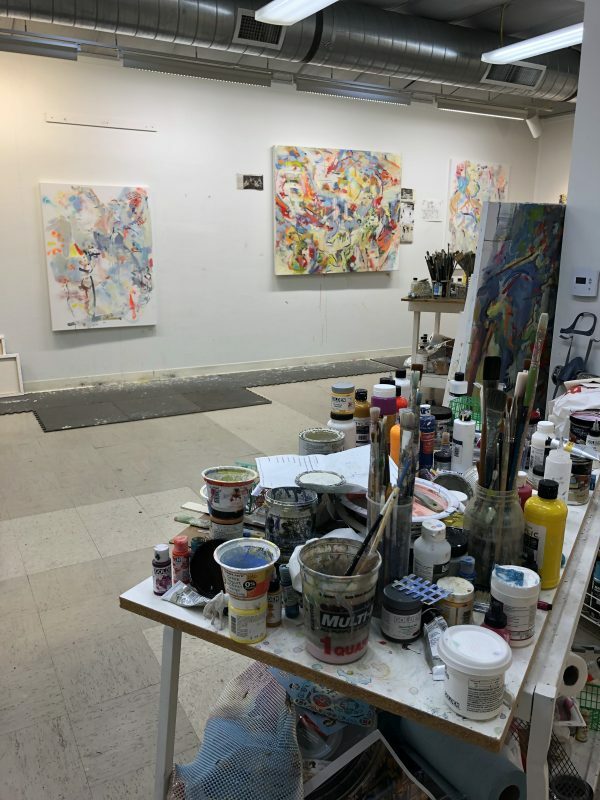 Although I don’t work directly from observation, my abstract paintings may reference my environment, objects in my studio and/or dance performances recently seen. Spatial mark-making is very important to the construction of my work. 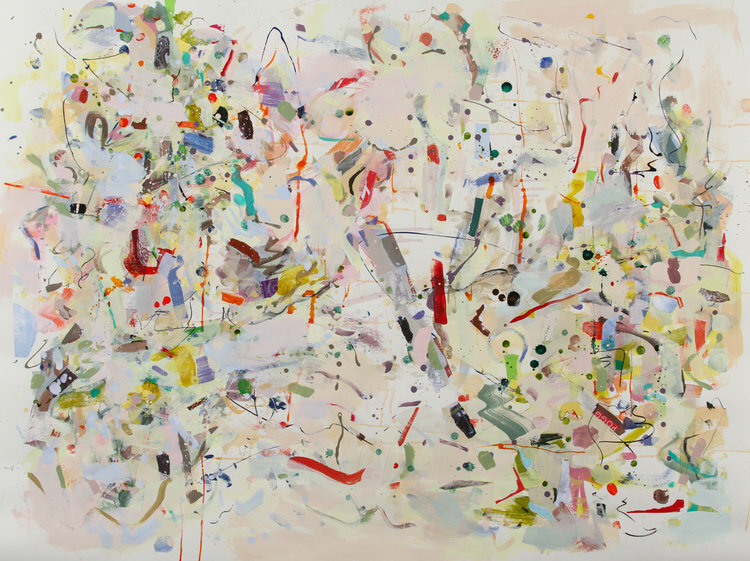 Gina Werfel ‘Notation,’ 2018. Acrylic, Pencil, Colored pencil on Paper, 84x127cm. I listen to Spotify or music in my iTunes library but each piece has to have a distinctive rhythm whether or not it is classical, contemporary rock or jazz. Secondly, I make sure to have several paintings or works on paper in process in various stages so as to not get stuck. Third is to have a morning latte to give me an extra lift to get started! This is the hardest question I face on a daily basis. Sometimes I’ll put a work away for weeks or months and then put it up on my studio wall to see if I am still satisfied. “Finish” to me means that the work is still “breathing” and that it has a good balance of openness and definition. I like to swim or bike or take walks. Living in northern CA, I swim outdoors all year round. I like to get together for drinks or dinners with my husband and/or with friends. I also like to go to galleries and museums. I don’t ever really unwind, as my painting is my life. Being married to an artist means we are always encouraging each other to keep working! Gina Werfel ‘Sign,’ 2018. Oil on Canvas, 51x41cm. What is your relationship to works of art history? In addition to viewing contemporary art in NY, LA and other cities, I enjoy discovering historical artists whose works inspire me to think differently about my own work. I have a long history of studying Italian Mannerist painters such as Pontormo and Rosso Fiorentino but also French painters like Bonnard, Cezanne and Matisse. When I was a visiting artist in Rome in 2016 at the American Academy, I fell in love with Andrea Pozzo’s ceiling painting for the Cathedral of Saint Ignatius de Loyola. I used it as a source for several paintings- the empty spaces provide a context for the interwoven figures writhing in movement in sync with the architectural elements of the space. My favorite part of the creative process is the possibility of change and openness to what comes next. Thank you, Gina! Discover her full artist page. Wonderful page – found it sti,ulating and fresh !! Love this Gina & your work! I’m in northern California now as well, so glad to see your wonderful process & know a fellow Studio School artist in the area!